Tsurubami Senri (闡裡　鶴喰, Senri Tsurubami) is a human Shinto priest and the head of the Senri Shrine. They used to be a feared dictator who ruled over Mugenri. Together with their best friend and closest ally Tenkai Zuifeng, the two ruled with an iron fist until Tsurubami decided to leave for the Outside World and spirited away Tsubakura Enraku and Yabusame Houlen in their place. Story wise, they are said to be a "super important character". Tsurubami is the former official Shinto priest and head of the Senri Shrine who was the dictator that lead Mugenri. It's unknown which generation of priest they served as, but there were at least three who came before them. They were a tyrant who ruled over Mugenri with an iron fist, heavily oppressing its people and youkai to some extent. Because of this, many youkai who were targeted hid away during the day, fearful of them. Tsurubami's initial and only appearance in the Len'en Project is in Evanescent Existence, where they were a playable character, albeit disguised as Tsubakura Enraku, as well as the Extra Stage boss. Despite the singular appearance, they are an incredibly important character. Ever since the start of Earthen Miraculous Sword, Tsurubami has not appeared in Mugenri because they are on vacation in the Outside World. As such before they left, they tested the strength of Tsubakura Enraku and Yabusame Houlen to see if they are capable of taking care of the Senri Shrine and Mugenri, which was their intention during Evanescent Existence. As such, they decided to give Tsubakura and Yabusame the role as Shinto priests, where Tsubakura is Tsurubami's successor who takes care of the traditional priest roles and Yabusame takes care of house chores. Overtime, it is said that their extended absence in the Outside World has led to the collapse of their rule, as well as the balance of Mugenri. Many people are relieved that they're gone. However, once the priest left, everything starts spiralling out of control with incident after incident. This suggests that Tsurubami is essential to keeping balance and order in Mugenri. Tsurubami going to the Outside World is the first time Tsurubami left Mugenri. Apparently, they went to the outside to search for an "item", and supposedly for "revenge", but nonetheless are working hard for a particular goal. Unfortunately, they are not used to the Outside World, and they are having a tough time living there mostly due to the lack of relying on their abilities, since they're forbidden in the outside. Little is known about their personality. They're a confident, energetic and dutiful person who tends to get carried away easily. Despite this, they are devoted to their job as the Senri priest as they are considerably militant, though they're still too willful and inconsiderate of others. According to Tenkai Zuifeng, Tsurubami is very carefree and often makes decisions on pure whims. During Evanescent Existence, they deal with problems by manipulating others to act and resolve things for themselves. They have a well-deserved reputation of being oppressive, manipulative and a dictator, and thus many humans and youkai in Mugenri feared – and probably hated – Tsurubami due to their immense power and unpredictable personality. They have a really bad reputation in Devanagara. When they disguised as Tsubakura Enraku in Evanescent Existence, their personally was more or less the same as their real self, appearing more joyful than the real Tsubakura. JynX has explicitly stated that Tsurubami is the strongest character in the Len'en Project. It is said that Tsurubami would be nothing if it weren't for their strength, and that strength could be on the par with the second- and third-generation priests of the Senri Shrine. It seems that Tsurubami is so powerful, humans, and even youkai, seem to be afraid of them due to their tyrannical rule. This is confirmed by Adagumo no Yaorochi and Sukune Katano in Reactivate Majestical Imperial. The only person thus far who is capable of fighting them is Xeno a due to their ability to manipulate probability. However, it's left open as to whether Tsurubami was going easy or not. It's unheard of that Tsurubami is defeatable. In the Extra Stage of Evanescent Existence, even though they have shown bizarre danmaku in their spell cards that are considered very hard to dodge, they were holding back. Thus, they have yet to show their full power, which they indicated that they could kill Tsubakura Enraku if at full power in said game. They simply stopped fighting and congratulated the player without showing a "defeated" portrait. Tsubakura also realises their strengh in Brilliant Pagoda or Haze Castle when they meet fake Tsurubami, stating "I've got no interest in battles I can't win." It is possible for Shion to eat Tsurubami's soul to get strong, but not become as strong as Tsurubami themself. JynX finds Tsurubami's abilities to be the most interesting due to having a wide variety of applications. Since Tsurubami is currently in the Outside World, they are unable to use their abilities freely outside Mugenri because it's forbidden. Tsurubami needs to write on ink in order to activate their talismans. With this, it appears to allow them disguise as people such as Tsubakura Enraku, by imitating their appearance and attacks. As shown when they transform into Tsubakura, they write an incantation on a piece of paper using ink. With it, they can turn between Tsubakura and themself quickly within a instant as the clothes melt away and change shape into something else. Additionally, the ofuda strips that surround Tsurubami are designed to be their weapons, in which they can write words on. Tsurubami is capable of raising poultry, but this is mostly a metaphor as it should not be taken literally. According to JynX, they have the "ability to raise potential". Tsurubami is able to stimulate and make use of the true potential of another character. Tsurubami releases the latent potential of someone or something other than themself by touching them while thinking about it. After raising it, they make it so that they too can use that strength. However, the ability to do so by oneself depends on the character. As such, they can create spell cards based on each character they battle, such as all of those during Evanescent Existence. For example, Hot & Cold "Dim Room" is based on Hooaka Shitodo's powers and Whirlpool Card "Spiral Galaxy Barrier" is based on Aoji Shitodo's powers. As the Senri priest, Tsurubami uses ofuda paper charms and is trained in youkai extermination techniques. They also display aptitude with shikigami, since they own the familiar of the shrine, Jinbei. As such, it's described that their duties involve "mostly incident resolving, maintenance of public order and maintaining the Mugenri Barrier," as well as performing exorcisms and good-luck charms. As stated, one of their jobs is to maintain the Mugenri Barrier. With this, they can travel between Mugenri and the Outside World. However, they cannot do this whenever they please as even they can find it difficult. Due to this difficulty, they were not able to send the humans from Evanescent Existence back to the Outside World. Most of the locations in Evanescent Existence were airspaces created by Tsurubami, and the location of Stage 3 is a corridor connecting these airspaces as a shortcut that only Tsurubami can enter (although Yabusame Houlen was also able to access this place as well). The bad ending of said game also stated that Tsurubami "lied down in a dimension gap", indicating that Tsurubami can indeed use gaps to travel to different places. An important symbol related to the Senri as a whole is the "eye", which is always shown as half-closed with a black background. It's mainly seen on Tsurubami's and Tsubakura's hat. Tsurubami also shows an eye on the palm of their hand during Evanescent Existence in a way that shows its importance. Not much is known about Tsurubami's history prior to the events of the games. What is known is that Tsurubami succeeded ownership of the Senri Shrine, as did their predecessors, and went out of their way to conquer Mugenri. and they were previously the official owner of the Dragonfly Castle. It's unknown since when Tsurubami was appointed as the priest of Mugenri, but they have known Tenkai Zuifeng from early age because their families were acquaintances. Tsurubami ruled over Mugenri with an iron first, so youkai and humans were terrified of them. They also antagonized some factions, such as the rulers from Devanagara. Tsurubami also helped Tenkai with a problem about a barrier. Afterwards, Tenkai became Tsurubami's most loyal ally and partner. The two resolved missions and youkai extermination together. But one day, Tsurubami went on vacations and planned to spirit away some humans from the Outside World who could replace them temporarily. Tenkai opposed to let some strangers in Mugenri, but Tsurubami did it anyway, causing the events of Evanescent Existence, and the Len'en Project as a whole. 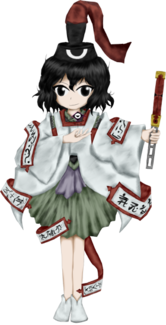 Their characteristics are likely to be from Reimu Hakurei , as both are a priest or shaman of their respective shrine (Senri Shrine/Hakurei Shrine ), and both are youkai exterminators. Since Tsurubami also rules Mugenri and is known as a very powerful character who can manipulate the Mugenri Barrier, comparisons to Yukari Yakumo are also plausable, since supposedly they also have control over gaps. Their full name is Tsurubami Senri (闡裡　鶴喰). Their given name Tsurubami (鶴喰) is an actual name in Japanese, where the first kanji means a stork or a crane, which are large, long-legged, long-necked birds. The second kanji means to "eat" or "drink". The kanji in their surname Senri (闡裡) literally means "clarify" and "reverse" or "inside" respectively. It's said that Tsurubami's name itself processes great power in Mugenri. Haiji Senri, a huge fan of Tsurubami, decided on changing their surname to reference Tsurubami's, although they modified the kanji rather than have a direct copy. They changed their name on a whim while Tsurubami was the current priest. Tsurubami has short, black wavy hair and pitch black eyes, where even their irides are pure black, referencing their monochromatic theme. They are dressed in a stylised uniform which resembles Heian period clothing such as a talisman-covered kariginu (狩衣, lit. "hunting dress") or a suikan (水干, lit. "dried with water"). Kariginu or suikan were worn for everyday clothes by the male kuge (公家, lit. "people of the Imperial Court"). The white uniform is modified, having it almost open on the front with an attachment around the chest area, and a V-shape cut on the back of it. Underneath is what appears to be a dark green hitoe (単衣, lit. "unlined kimono"), short enough to give the appearance of a skirt. A small, purple cloth is also wrapped around their waist. Under the kariginu/suikan is some red sparking from the neck and shoulder areas, likely to be part of the hitoe. Tsurubami wears an unusual hat, likely to be a kanmuri (遠紋, lit. "distant clan emblem"), a small lacquered hat with a "knob" on the back. Typically also with a ei (纓, lit. "hat tail") on the back, which is present on Tsurubami's. These hats were originally worn in formal situations by nobles in ancient Japan. The kanmuri requires a red band to keep it stable on their head, as revealed on one of the ending images of Evanescent Existence. It has an Eye of Senri on the front as an emblem to symbolize the Senri Shrine. This eye on their hat bears a strong resemblance to the Patagon Tribe's eyes in the game Patapon, but it may be a mere coincidence as it is unknown exactly where the eye comes from. Strangely, six scripts of ofuda wrap around their body, which have red strokes with an arrow pointing at the end, with Japanese charms written on them, They also hold a metallic, red rod in their left hand that's likely to be based on a kawahoriōgi (蝙蝠扇, lit. "bat fan"). They also have an "eye" in the palm of their other hand close to their chest. They also wear white footwear. Suzumi Kuzu's disguise as Tsurubami in Brilliant Pagoda or Haze Castle is pretty much the same as the real Tsurubami. However: they are left without a stick or an Eye of Senri in both of their hands, there are four ofuda scripts instead, the hitoe skirt is considerably shorter, and the hat's band is white. Instead of seemingly random symbols written on the ofuda scripts, the words "Bird of Unreality" (無現乃鳥, Mugen no tori), along with an Eye of Senri, and "Tsurubami" (鶴喰, Tsurubami) are written on two of them. Tsurubami takes on Tsubakura Enraku's appearance during Evanescent Existence, so like them, they have black eyes and short black hair with what appears to be two red stripes on the back of their head. Tsurubami was the culprit behind the events of Evanescent Existence. They spirited away Tsubakura Enraku, Aoji Shitodo, Hooaka Shitodo, Kuroji Shitodo, Kurohebi and Clause to the land of Mugenri. After placing them in different airspaces to train their newfound abilities, Tsurubami took Tsubakura's appearance and started to pick fights with the outsiders in order to test their strength. They were testing to see if one of these outsiders were capable of taking their current job as the shinto priest of the Senri Shrine. Tsurubami is a playable character, albeit disguised as Tsubakura, in the main scenario of Evanescent Existence; the real Tsubakura is playable in the extra stage. However, they cannot be played with until you complete the Extra stage with Yabusame Houlen, thus also completing the main scenario with them. Tsurubami started the jouney with picking a fight with Kurohebi in the Dimensional Cave, then with Aoji in their personal airspace. Eventually on Stage 3, when Tsurubami enters the Interconnecting Corridor (a dimension that only Tusurbami has authority to enter), they run into Yabusame Houlen, who had used their ability to cross dimensions in order to search for Tsubakura. They asked each other questions, then ended up fighting. During Yabusame's scenario when Tsurubami is the boss, they were making use Tsubakura's spell cards. They were also using talismans for their attacks, foreshadowing that Yabusame is actually fighting Tsurubami, not Tsubakura. After the fight, Tsurubami disappeared without warning, but they were captivated by Yabusame's abilities, calling them a "flying natural wonder". By the time they picked on Hooaka, they were getting tired of seeking people and they wished to finish soon, but they defeated both Hooaka and Kuroji nevertheless. After dealing with the outsiders, the priest decided to return to the Senri Shrine, which appeared to everyone else as a sun that casts a shadow. However, on the way, they ran into Clause, who believed that the portal was a star and that they would gain power from. Annoyed, Tsurubami fought them and revealed to them that they had been impersonating Tsubakura all along. Tsurubami is the Extra stage boss, or the "true" final boss of the game. Here, the real Tsubakura finally crosses into Mugenri, and since their impostor and Yabusame previously defeated everyone, Tsubaruka didn't have to fight the game's cast. They realized that someone has been impersonating them and went to confront that person, arriving at the Senri Shrine's grounds. Tsurubami revealed that their reason for spiriting everyone away was to find a temporary successor. Angered, Tsubakura fought against Tsurubami. The priest had ten bizarre spell cards to use against Tsubakura, but Tsubakura "defeated" them despite their serious strength. However, Tsubakura was still upset, because the priest was actually holding back. In the end, Tsubakura agreed to be their replacement. Shortly after, Yabusame appears to be arriving and Tsubakura told the priest to give them a hard fight. When Yabusame eventually arrived to the Senri Shrine's grounds in their scenario, they transported to a strange place called the Mugenri Barrier, who Tsurubami did not gave permission for. Yabusame first thought that Tsubakura changed their appearance, but soon realized that the priest was not Tsubakura, like they had previously thought and demanded the real one. When the two fight, Tsurubami used the same set of 10 spell cards, but was again "defeated". They went to tell Tsubakura, but the young scientist was already gone, not before leaving Yabusame a mocking note. It was then here Tsurubami was in a dilemma between the two, but they eventually gave both Tsubakura and Yabusame roles as a priest of the Senri Shrine and left for the Outside World. Tsurubami is mentioned during the Extra Stage. Apparently, Tsurubami and Tenkai were the original heroes of Mugenri and Tenkai speaks of them fondly, but disapproves of their idea to spirit away outsiders. Tsurubami is mentioned multiple times throughout the Brilliant Pagoda or Haze Castle. On the other hand, the priest seems to have a bad reputation in Devanagara. It's also revealed by Tenkai Zuifeng that they were the former ruler of the Dragonfly Castle until they left. Tsurubami also appears as the Extra+α boss; however, this is a fake because Suzumi Kuzu is disguising themself as them. Their disguise is very detailed that there is an official profile, a theme and spell cards for Tsurubami. Even Yabusame Houlen can't see through the disguise. It's currently unknown of what Suzumi's intentions were to disguise as them. Tenkai Zuifeng and Tsurubami had known each other since most of their life. Tsurubami helped them once after Tenkai had an accident with barriers. Afterwards, Tenkai became Tsurubami's most loyal ally and partner. After Tsurubami's long absence their rule has collapsed, Tenkai wants to put Mugenri to its former order, since now youkai and outsiders are doing as they please. Tenkai holds Tsurubami in extremely high esteem and wants to protect Mugenri, in Tsurubami's behalf. It's unknown what does Tsurubami think of Tenkai, but apparently they call them by their last name, Zuifeng. It appears that Tenkai is also the only one who knows the real reason why Tsurubami left Mugenri. Brilliant Pagoda or Haze Castle gives more details about their relationship. Apparently, Tsurubami and Tenkai were either feared, hated or respected due to being the dictators of Mugenri and their immense power. In the Haze and Brilliant endings, Tenkai muses about how much they miss Tsurubami and laments how despite being their closest friend, Tsurubami did keep some secrets from them. They both also owe each other a lot of favours on some basis, such incident resolution in the past. Jinbei is Tsurubami's shikigami familiar. However, they aren't their personal shikigami; they have been the Senri Shrine's shikigami for generations. Tsubakura Enraku and Yabusame Houlen are employees of Tsurubami who has agreed to replace them as a youkai exterminators, with Yabusame being an "Honorary Priest". Tsurubami choose Tsubakura to be the one who'll temporally success them while they're away. Despite Tsubakura's anger towards Tsurubami for impersonating them, they volunteered to replace Tsurubami as the current priest. Tsubakura and Tsurubami share a lot in common, mainly related to the monochrome theme, which made it easier for Tsurubami to disguise as them. In the case of Yabusame, Tsurubami was initially surprised to see them mess up their plans to spirit away outsiders from Mugenri, but after seeing their powers and potential, Tsurubami agreed to let them say at Mugenri. It's implied in Reactivate Majestical Imperial that the reason why Tsurubami agreed to let Yabusame stay it's because their powers are similar to Tenkai's. The relationship between Xeno a and Tsurubami is a very interesting one, as they first met at the casino where Xeno a worked, and then battled. But after this battle, Xeno a loved the thought of a battle and the probability of death and kept challenging Tsurubami on numerous battles, coming close to losing, winning, and even ended up drawing. It seems that the two are on somewhat good mutual terms, as they are both sparring partners. Xeno might have even looked up to Tsurubami as a role model, as stated in their backstory. They also gained depression once again when Tsurubami left for the outside world because they had nobody to fight with. Haiji Senri is Tsurubami's biggest fan who goes as far as to love them. Although Haiji shows great passion for Tsurubami, apparently Tsurubami used to find them a nuisance. It appears that Haiji is so obsessed with them that they decided to copy their surname. They frequently hung around the Senri Shrine's former priests, and are one of several people who got a close look at the course of Tsurubami's conquest of Mugenri. There is a possible relationship between Suzumi Kuzu and Tsurubami. Suzumi was able to disguise as Tsurubami during Brilliant Pagoda or Haze Castle, with the disguise being near-perfect to the extent that Suzumi could use Tsurubami's ability temporarily, but not master it. Certain characters have noted that Tsugumi Umatachi had once "meddled with Tsurubami's affairs" in the past, implying that there is some sort of vitriolic relationship between Tsugumi and Tsurubami. ↑ Hahakigi (帚木, literally "broom tree") refers to a certain tree which was popularized in a poem by Sakanoue no Korenori as a symbol of something or someone who can't be reached. ↑ Tsubakura's final card from Evanescent Existence. Tsurubami is the only character throughout the Len'en Project who does not appear in Brilliant Pagoda or Haze Castle as their true self. They are frequently mentioned, and Suzumi Kuzu disguises themself as them during a boss fight. It appears that Tsurubami, although very minorly, is able to speak English, as shown in the extra stage of Evanescent Existence. If the spell cards used by Tsurubami when disguised as Tsubakura are indeed theirs, then Tsurubami has the most spell cards in a single Len'en Project game. Tsurubami is the only human in Evanescent Existence to be a Mugenri native, while the rest of the humans in the game are outsiders. Tsurubami is one of the few characters to know the existence of the Dimensional Cavern. Whenever Tsurubami, disguised as Tsubakura, talked to an outsider, they closed the eye on their hat. Tsurubami's spell card "Bird's Eye -Black Eye-" left the biggest impression on JynX because of how they could represent an eye with danmaku. Tsurubami's in-game sprite becomes black and white when moving, giving a nod to their monochrome scheme. Tenkai Zuifeng and Haiji Senri are also capable of doing this. When asked about Tsurubami's handwriting, JynX says that while they should be able to write neatly, they do not as they don't do things seriously. ↑ "If they're serious they should have good penmanship. However, since they're usually not they mostly write messy words." This page was last edited on 19 April 2019, at 16:10.